Happy New Year! Here's to a great 2013! I have another card to share from the December My Creative Time Stamp Release! I'm in the process of making thank you notes for the gifts my students gave me, and this one was an easy one to mass produce! I used some Recollections brand embossed 3.5 x 4.8" cards from Michael's for the base. 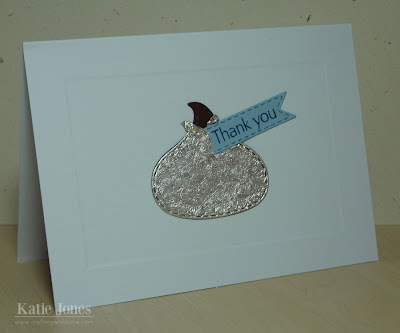 Then I just added a little die cut that I made with the chocolate candy die from Chocolate Greetings. I cut it once in brown cardstock and once in foil, and I folded down a little bit of the foil to show some "chocolate" peeking through. The sentiment is from Thank You Hugs, stamped on the little banner from Chocolate Greetings. There is a great sale going on right now in the My Creative Time Store! You can use the code NEWYEAR at checkout to get 20% off your entire purchase! This sale will end on Sunday, January 6th @ midnight PST! Oh this thank you card is so simple but so cute!!! I love it and love this release! Thanks for showcasing it so nicely!! This simply made card is just sweet. mmmm chocolate! love this katie! This is so cute Katie! Happy New Year! very cute hop ei win! Katie ~ ADORABLE and so CAS!! PERFECT way to say Thank You!!! Very nice. Thanks for sharing and inspiring. Thanks so much for sharing (I think! My wallet might beg to differ! ;)!